Wolfgang Amadeus Mozart was a prodigal. When he was five he could play the violion and the piano and he started composing. In 1762 he performed before Maria Theresia. In 1764 and 1765 he visited Johann Christian Bach in London. When he was seventeen years old he became a court musician in Salzburg. But he was restless and travelled a lot. In 1777 he visited Mannheim where he met the Weber familly. He fell in love with their oldest daughter Aloisia, but she rejected him. They moved on to Paris where his mother died on 3 Jul 1778. In Paris Mozart met J.S. Bach again. They had met before when Mozart was still a child. In 1781 he visited Vienna and at that time he was dismissed from his position in Salzburg after a quarrel that also turned his father Leopold against him. In Vienna he stayed with the Weber family and this time he courted the third daughter, Constanze. They married on 4 Aug 1782 after Leopold reluctantly consented. His opera "Die Entführung aus dem Serail" was an instant succes in 1782. IIn Vienna he befriended Joseph Haydn. Between 1782 and 1785 he gave succesful piano concerts and he rented an expensive appartment. In 1784 he became a freemason. His opera's "The Marriage of Figaro" (1786) and "Don Giovanni" (1787) were both succesful. By 1788 his financial position had worsened. Austria was at war and the aristocracy spent little money on music. They moved from central Vienna to Alsergrund, but Mozart continued spending money and had to borrow from others. In 1789 and 1790 he gave concerts all over Germany but his financial circumstances hardly improved. Constanze took over the financial dealings of the household and by 1791 things finally improved. Mozart composed "The Magic Flute" and he was reducing his debts. When he was in Prague for the premiere of "La clemenza di Tito" he fell ill. He was able to conduct the premiere on 30 Sep 1791, but in November his condition worsened. He was nursed by Constanze and her sister Sophie, but he died on 5 Dec 1791 in Vienna. The exact nature the his illness that killed him is unknown. He was buried in a common grave, but this was not because he was very poor. It was simply customary in middle class families at the time. After his death Constanze managed to publish his work and opganised memorial concerts. By the time his star was rising again it was no longer possible to trace the exact spot of his burial. A memorial was erected near the place in later years. The monument for Mozart at the Marxer Friedhof in Wien-Simmering. 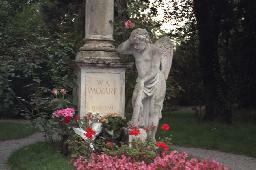 Mozart was buried at this cemetery, but the exact location of his grave is unknown. 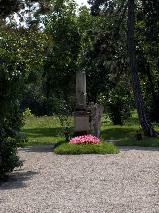 The monument for Mozart at the Marxer Friedhof, Vienna. 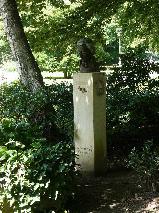 Bust of Mozart at the Stadtpark, Graz.